Nasa finds a takoyaki plate among the items stored by Kaname and Aya’s father. Tsukasa explains what it is, then suggests making takoyaki. Nasa feels they should have a takoyaki party. He invites Kaname over, who accepts. However, she’s unsure if Aya will accept. Aya shows up and accepts, deciding she’ll show Nasa which girl is best to be his wife. Nasa reports that Aya and Kaname will attend the party while their mom mans the bathhouse. As such, Tsukasa decides to make other things in addition to takoyaki. Meanwhile, Aya feels there’s no way that Tsukasa will be good at cooking. When they come to Tsukasa and Nasa’s detached room, Aya is stunned to see pasta, pizza, and other delicious foods. Not only that, but the taste of said foods is amazing as well. Aya realizes she’s falling into a trap. Therefor, she decides to challenge Tsukasa to play a party (video) game. Tsukasa is down for this as Nasa and Kaname look on. 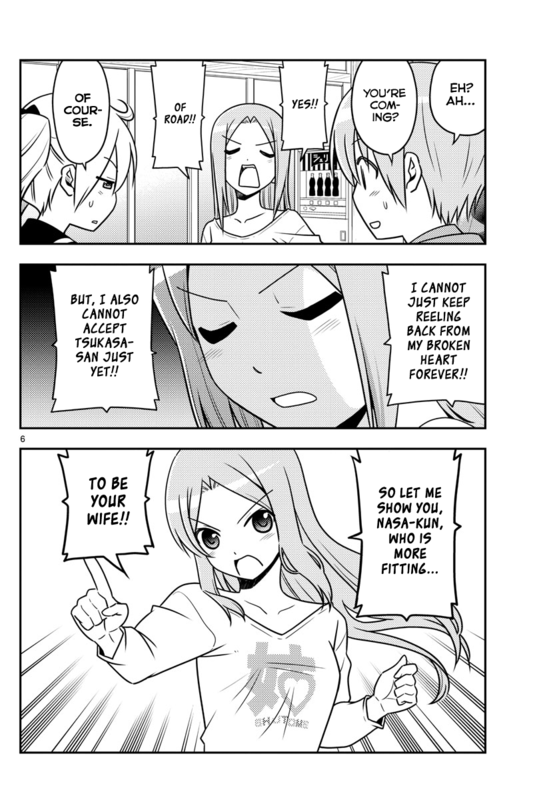 Recently, the chapters of Tonikaku Cawaii have been nice and such, but nothing overly special. However, with Tonikaku Cawaii chapter 41, we got the start of something good. What made things funny is that Aya went in to the party to show that she was the perfect wife for Nasa. Tsukasa didn’t really seem to know that Aya was coming on with this kind of challenge, at least at first. As such, she’s wracking up the wife points left and right and not even knowing it. Now that Aya actually laid down a challenge to Tsukasa to see who’s the best at video games, I’m really looking forward to seeing that battle. I feel badly for Aya already. OK, time to wrap up this review of Tonikaku Cawaii chapter 41. I had to laugh at how the genius Nasa didn’t know what a takoyaki plate was. And speaking of takoyaki, its funny that no one has made any yet. 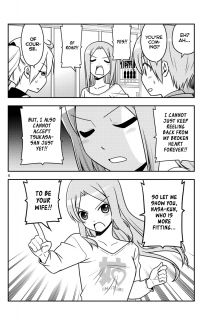 In the end, Tonikaku Cawaii chapter 41 is a rather fun chapter, allowing us to start a battle of sorts between Aya and Tsukasa.